Area where there is nothing. This is what Namibia means in Khoekhoe, the language of the Nama people. It is a large place, Namibia. It is twice the size of California, a twelfth the size of the entire United States. And yet, life here is sparse. California holds some forty million people; Namibia is home to just two million. With fewer than three persons per square kilometer, it's the fifth least densely populated country on Earth. It's not our first time in Namibia. A few years ago, we drove a bakkie up from South Africa and spent three weeks roaming these vast distances with an engine, hundred of liters of water, and four-wheel-drive. This time, we're traveling more slowly. We're carrying less. We're excited to return and we're nervous to return. 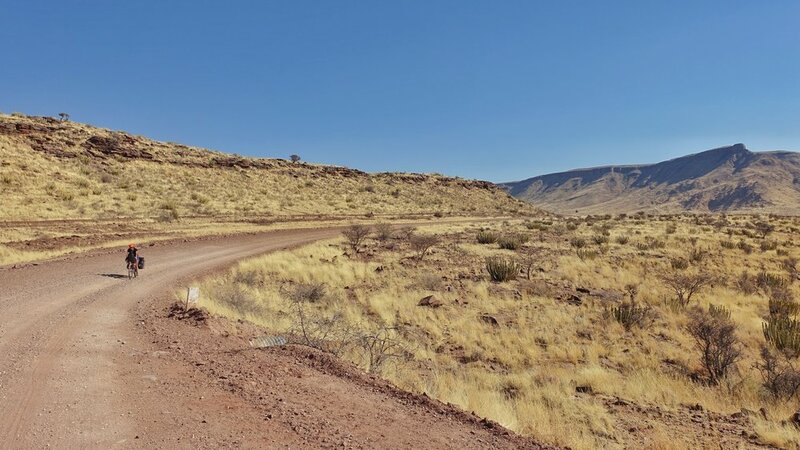 Most of all, we're eager to get off this miserable South African road, this heap of rocks and sand fifty kilometers long that has taken us more than a day to cross. Ahead is the Orange River, the natural boundary between the Republic of South Africa on the southern bank and the Republic of Namibia on the northern bank. Ahead of that, we're promised, is a better road. But first there is a border. We arrive at the crossing post, fill our water bottles, and get our passports stamped. We're pointed across the river toward the immigration office at the Namibian end. There's a narrow bridge connecting the two sides. We begin to cycle across it. We see figures on the bridge. Small, dark, seated on the pavement in the sun. Scattered all along it. Baboons. I don't care much for baboons. My interactions with them have been limited, but I've read that baboons accustomed to humans don't scare easily. They have four-inch fangs, and a pack mentality, and the courage to take something they want. And we, we have bicycles and no barrier and lots of loose, dangling, shiny bits that may or may not entice these lounging primates. But there is just this one bridge, and it must be crossed. So we do what seems the most sensible thing, and start across it, slowly, ringing our bike bells every few seconds. Thankfully, it frightens the baboons, or at least disturbs them enough to rise, lumber to the edge of the bridge, and drop down to the rafters or the river below. The path is momentarily clear, and we cross hastily. The Orange River is a lovely sight, for it is the only river we've seen in South Africa (and the only river we'll see in Namibia) filled with water. It seems an oasis for the local fauna, and the chimes of our bike bells are answered by the varied chirps of dozens of birds. On the other side, we're greeted by a large, glinting sign welcoming us to the second country of our journey. Immigration is smooth and quick. We ask for three weeks and are given permission to stay for a month. There's a road tax for those driving in from South Africa, but on our bicycles, we're not required to pay it. The border guards are friendly and wave us on. It takes a few more days to reach Karasburg, the first town from the border crossing. We've lost over six hundred meters of elevation in our descent to the river, and this must now be made up as the Karas Mountains rise into Namibia. 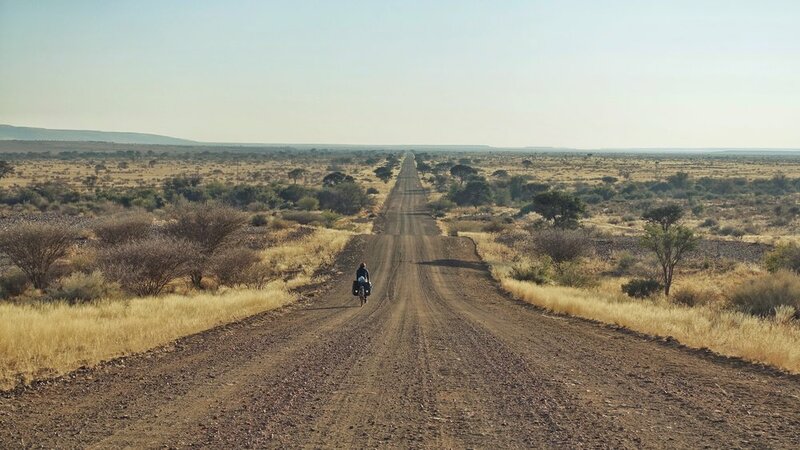 There is a headwind, and though the road is indeed better than its cousin back in South Africa, it's still gravel, and gravel is slow to cycle through. It's hot, too. In just a few dozen kilometers, the climate has changed. We go from sleeping in layers of shirts, sweaters, and coats to sleeping in shorts and a thin top. During the day, the sun sears our skin as flies dance circles around our heads. The landscape isn't terribly different than it was back in Pofadder, but it feels as though the season has changed almost overnight. We spend a day resting in Karasburg. We stock up on groceries and water bottles and solicit thoughts from the locals on the long road ahead. It is dry, they say. Drier even than the Karoo. This is the Kalahari we are entering, and it is desolate and unforgiving and hot and sandy. It is trying. I've grown obsessed with the amount of water we're carrying. It's important in a grave sort of way, and we know we can't rely on a refill anywhere along the next 280 kilometers to Koes. This distance, in perfect conditions, might take three days. But in poor conditions, in the event of washed out roads and uphill climbs and strong winds, it might take a week or more. If it is cool, we might get away drinking just two or three liters each per day. But it is the Kalahari, and so it is hot, and so our bodies may need more. Four liters per day, five liters per day. But water is heavy. We end up strapping and squeezing and stuffing a collective thirty-five liters of liquids onto our bicycles. All this weighs thirty-five kilograms, seventy-seven pounds, and that doesn't include the food for these days, the gear, the bikes, our bodies. We will be moving sluggishly. It's been nothing but gravel, rough gravel, since Loeriesfontein. And it will be more of the same most of the way to Botswana. But there's a route out of Karasburg offering fourteen kilometers of tar road, of smooth, beautiful asphalt, and we sail along it as if floating on clouds. The fourteen kilometers ends, and then it is back to the bumping and it is back to the sliding. Namibia's roads may not be of the highest quality, but its road-naming conventions are just brilliant in their simplicity. There are the B roads, like the one we were just on, and the B denotes pavement. B roads are tar roads. C roads, such as the C20 or the C15, are unpaved, but re-graded regularly and ostensibly well-maintained. C roads should not feature corrugation or potholes or washouts, at least not for long. Then there are the D roads, gravel roads that are less-traveled and maintained less frequently. They are usually in worse shape than the C roads. There are no E roads, but there are F roads, accessible only with four-wheel-drive (or, I suppose, a suspension fat bike), and M roads, which seem almost like a wild card; they may be decent or they may be the very worst. No roads are A roads, which is charming in its aspirational undertones. This route to Koes, it's D roads and M roads all the way. We begin on the D203 and it is not terrible. We cross an unnamed M road that is barely navigable and requires regular pushing of our bikes through deep sand and over piles of rim-shattering rocks. We turn onto the D201, and it starts out promising but falls apart quickly. The scenery, though, is quite pretty. There's almost a florescence to this bit of the Kalahari. It's all yellows and beiges and browns, all tall amber grass and hills with flat tops, all undulations and depressions to every horizon and beyond. It's plain, yet when the sun hits the scorched weeds the colors seem to howl, to scream neon, to glow green, and this is a pleasure to look at. Looking must be done carefully, for the road ahead always presents hazards. Large stones are the most common, but as we continue north the hard earth gives way to loose sand. The seasonal waterways that carve their course through the desert are dry now, but when they run, they run wild. They carry fine sand over their edges and they flood the road, washing away those things that provide bicycle tires traction, replacing those things with pits of sand. Some can be charged through. As a sandpit approaches, we stamp on the cranks and gain some speed and do our best to slide through the deluge while remaining upright. But some stretches go on, and our bikes just stop, and then we must dismount, and walk them, heave them and their dozens of pounds of gear and food and water toward higher ground. Our legs are bloodied. More than once, we smack a calf or an ankle or a shin into the hard edges of our steel pedals and yelp in pain. Skin tears and scabs form. Flies continue to drive us mad, and our bodies become covered in a film of dust and dirt. This is not rewarding travel, nor is it fruitful. We make minimal progress each day: thirty, forty kilometers for hours of effort. It is a walking pace, and indeed, much of it is done walking. We relish our afternoons and evenings. When we've had enough, we haul everything to the side of the road and pitch our tent right there. It's warm enough to leave the rain fly off. We read books, listen to podcasts, make dinner, talk, remark on the best and worst bits of the day. When it grows dark, we look up at the stars, spot satellites sailing along Earth's orbit. This is all before 6PM, this darkness and diversion, and so we're usually asleep before seven. We try to rise early to beat the heat and the headwinds and the flies. After perhaps twelve hours of slumber, we're woken by the sun. We repack our lives and continue on. More often than not, not a single vehicle passes us all night. The D201 becomes the D611. The D611 is still a D road, but it's in better shape and descending. We've reached the highest point on our journey through southeastern Namibia, and it's downhill from here, all the way to Koes. On the fourth or fifth day, we reach it. Like Pofadder before it, Koes is a small, broadly unremarkable farming village. It's the kind of place one might pass by in an automobile and barely notice as anything more than a few one-story buildings on either side of the road. But for us, it is a lovely sight. It is a source of water, of food, maybe of a shower, a place to do laundry, a bed to sleep in, some internet, some rest. We reach the quiet crossroads on the outskirts of Koes and see two signs. One is for a hotel, five hundred meters to the right; the other is for a coffeeshop, an undisclosed distance to the left. We discuss where to go first. We are tired and hot and thirsty, and the hotel seems the better choice. But we are on a budget, too, and hotel rates are typically over that budget. We wonder if whoever runs the coffeeshop might know of a cheaper guesthouse in town. We turn left. The signs to the coffeeshop wind through the entirety of the small town along rough, bumpy roads. We look around as we pedal, say hello to a few people, and find the shop, upon arrival, to be closed. So we just cycle onwards to the hotel, completing the counter-clockwise circuit across Koes in a matter of minutes. The hotel is quiet and empty. We walk around back and are greeted by the proprietor, who offers us a simple room at a reasonably negotiated price. It's felt like ages since our last time indoors, and we waste no time in dropping our panniers and packs on the floor of our room and emptying their contents. I retreat to the bathroom to begin washing my clothes in the tub. The water turns a muddy brick color almost as soon as it hits them. Meanwhile, Lauren calls from the bedroom. "I can't find my phone," she says. I emerge and she's rifling through her backpack, the bag that sits in her handlebar basket, the bag that carries her cell phone and other important items. It's not a very big bag. Concern strikes us both. It turns to worry. We look quickly around the room, on the covers, under the bed.